I love meeting you all. I love getting to help you (in person) spend less on groceries. And that’s why I’m coming to YOU! I’ll be at Books and Company in the Greene in Dayton on Tuesday (that’s tomorrow!) night at 7 pm. Then I’ll make my way south…heading for Atlanta. I’ll be Borders in Marietta (Atlanta area) on Thursday, January 6th at 7 pm. 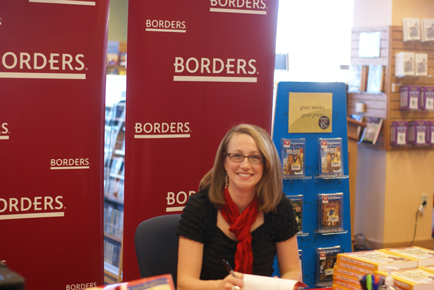 I’ll be at Borders in Orland Park, IL (Chicago-land) on Tuesday, January 11th at 7 pm. Finally, I’ll be at Barnes & Noble in Edina, MN (Minneapolis area) on Thursday, January 13th at 7 pm. Here is where you can find the addresses for each location and complete cookbook tour information. If you’re in Dayton, Atlanta, Chicago or Minneapolis, I’d love to meet you, chat with you and sign a cookbook for you!!! I was thinking about you tonight. I made your white sauce for a chicken broccoli pizza. When will there be more dates announced? I am hoping you will make it to Kansas or Oklahoma so I can try for a book signing event. We are in St. Louis and would love to meet you! Congrats on the new book.